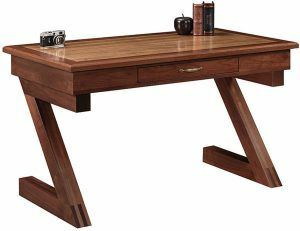 Brandenberry Furniture perfectly blends traditional and modern design with their new collection of writing desks. The Custom Kipling Writing Desk features Z-shaped legs, a rich wood finish, a storage drawer and a lush inlay. The Kipling is merely one desk in a new series of writing desks. Each desk is crafted by artisans using regional hardwoods and Old World woodworking techniques. Each comes standard with a 1” solid wood top, a sturdy storage drawer and a variety of custom options. A bold, modern design accents the timeless Kipling Writing Desk. Furniture-lovers will appreciate the classic designs and durable craftsmanship. While literature-enthusiasts will find the desk names (each named for a famous writer) intriguing. The Kipling Writing Desk features a rich finish, elegant design and striking inlay that echoes the exotic beauty described in so many of his stories. The Dickens Writing Desk boasts a straight-angled desk top offset by curved legs reminiscent of industrial Great Britain. The Whitman Writing Desk features the simple elegance which we have come to associate with early-American style furniture design. Choose from a variety of wood species, corner, and inlay options to create the perfect furnishing and capture the essence of the world’s greatest writers in a timeless furnishing.